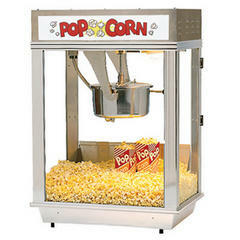 This 12oz Kettle Popcorn machine is great for larger events. If your looking for a machine to produce more popcorn in less time this machine is for YOU! The machine requires its own dedicated 110 outlet (nothing else plugged in with while running) which it must be plugged in directly with no extension cord.